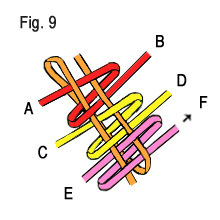 The Eight-End Box Stitch Instructions makes 1 sample about 3 inches (7.6 cm) long. 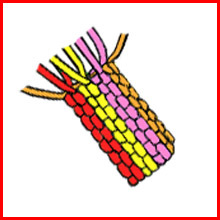 Two 1 foot strands of plastic lacing = approximately 1 inch (2.5 cm) of stitches or knots. Fig. 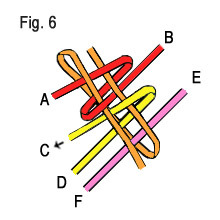 1- First find the centers on 4 strands of Rexlace. 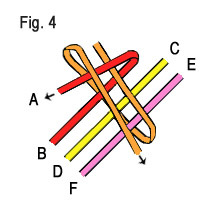 Lay the lacing out as shown, with three strands running parallel over one strand or the guideline. It may be helpful to mark by lettering or numbering the ends of the lacing to help you follow along. Fig. 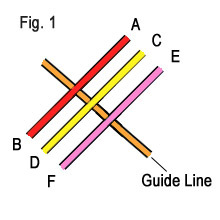 2- Fold one end of the guideline over strands EF, then CD, and AB. Fig. 3- Fold the other end of the guideline over strands AB, then CD, and EF. Do not let the guidelines cross. Fig. 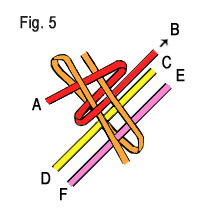 4- Fold strand A over the first guideline, and under the next. When making your stitches, just remember OVER then UNDER. Fig. 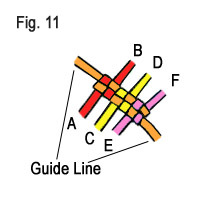 5- With strand B, pass is over the closest guideline, and under the next guideline. 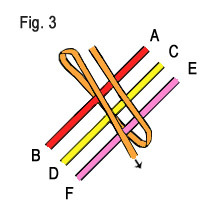 Do not allow strand A and B cross; they are to run side-by side. Fig. 6- Taking strand C and fold it Over the first guideline, and Under the next. Fig. 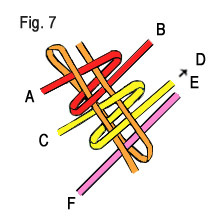 7- With strand D, fold it Over the closest guideline, and Under the next. 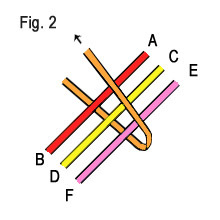 You do not want strand C and D to cross, or this will make a mess. Fig. 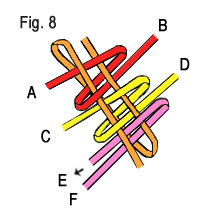 8- Fold strand E over the first guideline, and under the next. Fig. 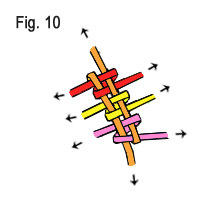 9- With strand F, fold it Over the closest guideline, and Under the next. Again, you do not want strand E and F to cross, or this will make a mess. Fig. 10- Grasp all (8) loose ends and tug evenly to tighten and complete the first stitch. Fig. 11- Once the first stitch is tightened, it may try to bend, bow, or arch a bit. Try to stretch it so that it remains flat. See here that the pattern is laid out. Continue following Box Stitch pattern until you achieve the desired length. To finish, dab glue on the end, make sure it's covered in the cracks. When the glue dries, trim the ends. Reapply glue to prevent the ends from unraveling.